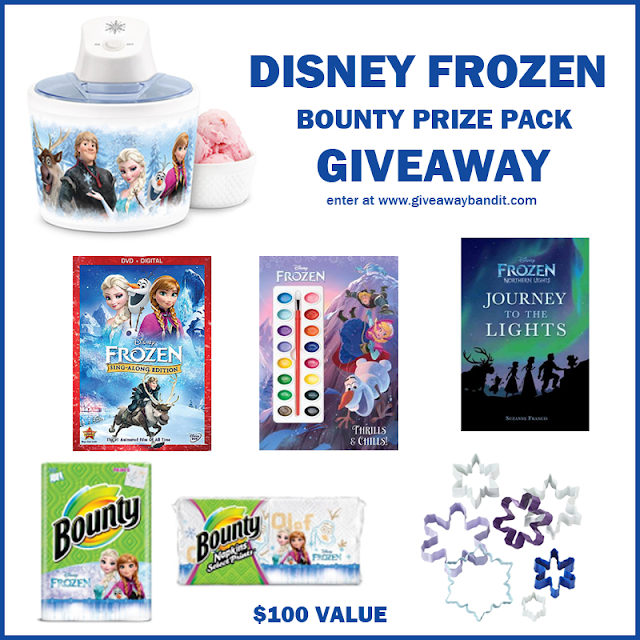 Win this fantastic prize pack featuring Bounty and Disney's Frozen! Giveaway is open to US only, ages 18 and older. Giveaway ends February 6, 2017 at 11:59pm EST. Enter to win via the giveaway form below and good luck! Disney Frozen Bounty Prize Pack Giveaway Be sure you’re following us on social media to get the latest giveaways and more: Facebook | Instagram | Pinterest | Twitter | Youtube Disclosure: If you have any question please send an email to info@giveawaybandit.com. All entries are optional, if you do any of the tasks you can collect the entries, but if the winner task is a task you did not complete, a second winner will be chosen. No purchase is necessary to enter. Void where prohibited by law. The odds of winning are based on the number of entries received. Open to the United States only, 18+ only. Confirmed Winner(s) (by Random.org) will be contacted by email. Winner(s) have 48 hours to respond before a new winner is chosen. The sponsor(s) will be responsible for product shipment to winner(s) of this giveaway. The Bandit Lifestyle is not responsible for product shipment/delivery. This event is in no way administered, sponsored, or endorsed by, or associated with, Facebook and/or Twitter, Google, Pinterest. This disclosure is done in accordance with the Federal Trade Commission 10 CFR, Part 255 Guides Concerning the Use of Endorsements and Testimonials in Advertising. Your giveaways are always for fun things...thank you!